MONEY – Probably the place the start. Some of our clients have cash. Most do not. In that case, it becomes a little more involved. You should remember that you are really building the bank’s home. By this, we mean that they do have a say in what they will and will not finance. The appraisal process largely determines what they will loan in a given area of town. We are always pushing the lenders to consider other factors in appraising our homes. We often do preliminary or “desk” appraisals for our clients when looking at land to determine what building costs could be in a given area of town. LAND – The cost of land in the Wilson County area varies, depending on the neighborhood. Things to consider are location, schools, transportation, land clearing, demolition costs, flood plain issues, soil conditions, and so on. Most properties are listed on MLS, but a good realtor will have other sources for finding the right lot for your project. In driving around a desired area, you may even find for sale by owner lots. However, these are generally unrealistically priced by an overly optimistic seller. It is critically important to have your builder and architect or home designer, as well as your realtor, look at a desired lot to determine if it is feasible for the project that you wish to build.​​ We will help you ensure that the lot is acceptable for the home that you wish to build. Is it big enough? What about setbacks and easements? What will the footprint of the home be? Where will the garage go and how will the driveway be laid out? Is it in the flood plain? If so, how high up will it have to be built? Can a large tree be saved? PLANS – ​​​​This is the fun part, or at least it should be. So far, we haven’t built for someone that just hit the lottery, so we expect everyone will have a budget. As the client, you are in charge of the cost of the home, so try to be in charge from the start. Don’t wait until the house design is complete to find out that it costs way too much! You control three variables in the design process. They are the budget, the square footage and the quality of the finishes. We can help you understand how these are related and how to make sure that there are no surprises once the design and engineering are complete. Chris Matthews Custom Homes has the experience you need to guide you through each step of building your custom home. 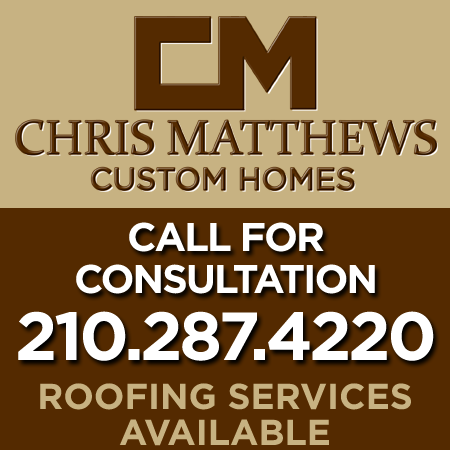 Schedule a Builder Meeting today: (210) 287-4220.